Improve the atmosphere of your league or tournament by hosting a Conduct 1st Environment. We provide Youth 1st Team Awards in every sport and activity. Help us put our Youth 1st. The lasting value of participating in sports comes from helping our young people learn to Become Their Best. All programs should be held to this standard. Be RESILIENT – Acknowledge that failure will happen, not to fear it, learn from it and get better – move forward, don't quit. Be RESOURCEFUL – Learn to adapt to changing environments, changing personnel, learn to make adjustments, learn to problem solve and think differently. Be RESPONSIBLE – Own it, learn to take responsibility for one’s own actions, be accountable. Be RELIABLE – Do the right thing, all the time. Show up, make the most of your opportunities. Be RELATIONAL – Take your eyes off yourself, learn to work with and for others, be a giver – not a taker, learn to communicate well. The VALUE is in each person’s development, not their performance! We put Youth 1st by promoting an atmosphere in communities where children have the opportunity to participate in programs that encourage them to be active, build relationships and develop into the best version of themselves. Next, we emphasize Character by promoting a perspective of development vs performance. Development is a process. It takes years for kids to develop not just the physical skills to compete, but the mental, social and emotional aspects as well. Performance can play a role, but it should be viewed as one aspect of the development process. Hosting Conduct 1st Environments during competitions and integrating Character 1st Presentations into preseason kick off meetings with parents and coaches help prioritize the development perspective. The importance of Conduct and Character is celebrated and reinforced through the Youth 1st Team Award ceremonies and partner experiences. 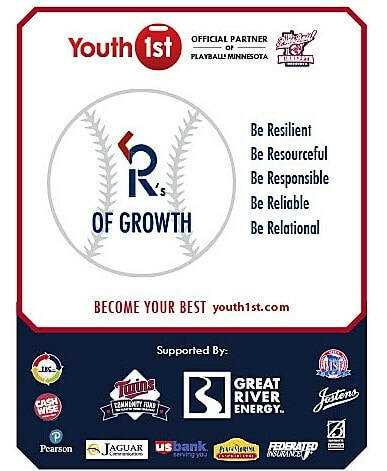 Partner experiences are provided through the generous support of the MN Twins, MN Timberwolves, MSU Mavericks and Mankato MoonDogs. We have developed tools that include training modules for parents and coaches, Word Play refrigerator magnets, FUN night theme kits and player cards at the professional and collegiate level that include Youth 1st messages. Once we have established relationships in the ​Community, we help unify community leadership (facility owners, business leaders, youth leaders) to integrate Conduct and Character standards into all youth activity programs. Changing the culture in a community requires consistent and repetative messaging to parents and leaders. Participation in youth sports and other activity programs offer many physical, social, emotional and cognitive benefits when young people have access and inclusion in quality experiences. Participation matters. Additionally, Youth 1st Community Events encourage partnerships and promote unity between programs, organizations and sponsors. Thank you for putting your Youth 1st! Youth 1st is a Minnesota 501(c)(3) Non-Profit, founded in March of 2010.